The limited fresh water resources require more efficient water management. Non-conventional water resources such as saline drainage or brackish groundwater and treated waste water could be used under suitable and careful management that safe guards the environment and minimizes the long term impact. Models when successfully calibrated and validated can be used as management tools to predict the impact of different management of crops, soils and water qualities. They can be used with “what if” scenarios instead of running short term expensive and labour intensive field experiments. Dr. R. Ragab, CEH has developed an integrated field scale management model, SALTMED that can be used as a management tool for water, crops, land and N fertilizers. 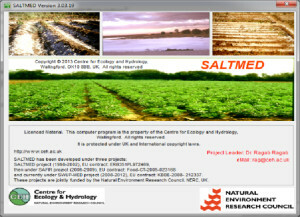 SALTMED is a physically based model that uses an integrated approach. Unlike existing models, which were designed for a specific irrigation system or a specific process, SALTMED model is generic. It can be used for a variety of irrigation systems, soil types, soil stratifications, crops and trees, water application strategies, different nitrogen applications and water qualities. Time: 08:30 a.m. – 12:30 p.m. The participation in the ‘SALTMED Workshop’ is free of charge and will be certified by a Certificate of Attendance. Please bring along your laptop and pre-load the model (copy the folder from the link below to your desktop) to maximize your benefit from the workshop.